Download your digital resources for Cheng & Tsui titles. To access purchased content or to download files from the Companion Website, you will need to create an account and register your product. Sign in to an existing account or register a new Cheng & Tsui account and enter your product key exactly as it appears. Integrated Chinese Enhanced eBook Level 1 Part 1, 3rd Ed. Cheng & Tsui is pleased to offer our best-selling Integrated Chinese series in a NEW STANDARD eBook format. We have partnered with some of the leading academic eBook providers to give students the best possible learning experience. To order, please click on the link above to purchase directly from the provider. With an emphasis on practicing a broad range of written and verbal communication skills and building cultural understanding, the series is ideally suited for students who want a comprehensive grounding in the Chinese language. Coordinated practice develops students' listening, speaking, reading, and writing and builds proficiency in using the Chinese language in a variety of real-life situations. 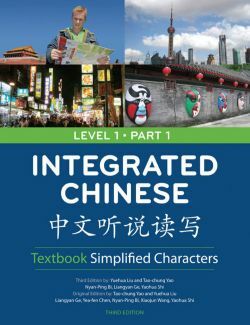 Throughout the series, Integrated Chinese incorporates the three modes of communication—interpretive, interpersonal, and presentational—and ACTFL's "Five Cs' : Communication, Culture, Connections, Comparisons, and Communities.Integrated Chinese, the leading introductory Chinese textbook at colleges and universities around the world, offers comprehensive instruction and an array of print and digital options. With content organized into 10 engaging lessons per volume, Level 1 Parts 1 and 2 feature flexible pacing, communicative activities, up-to-date vocabulary, and extensive cultural notes. An exciting storyline links all dialogues and readings. Level 2, with 10 lessons in each volume, includes exercises in each lesson, and accommodates flexibility in teaching schedules. The series is a two-year course that includes textbooks, eBooks, workbooks, character workbooks, online workbooks, audio CDs, and teacher's handbooks. Materials are available in both simplified and traditional character versions. ©2019 Cheng & Tsui Company, Inc.